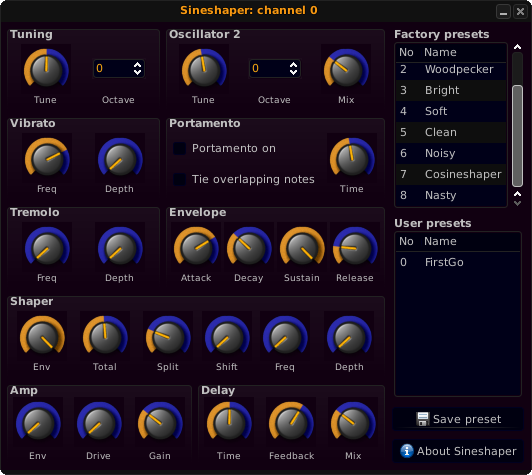 Sineshaper is a realtime, touch-sensitive monophonic virtual softsynth for linux. Once installed, just type sineshaper in a terminal and it should open. To run it with ghostess, run ghostess sineshaper.so. Sineshaper consists of two sine oscillators, each with an octave tuning dial in the upper area of the GUI. The "tuning" section to the upper left controls the overall tuning, with fine tuning and octave tuning, up to a maximum of 10 octaves up or down. Oscillator 2 can be finely detuned plus or minus one octave, as well as up to 10 octaves up or down. The "mix" knob controls the amplitude amount of each oscillator, and will modulate between the two waves when centered. There are vibrato and tremolo controls which can be modulated for speed and depth. The vibrato depth is hardwired to the Modulation Wheel midi CC. Pitch bend of plus-minus 2 semitones is incorporated. Portamento can be applied, as well as a legato (tie) effect. At the bottom of the interface are global controls for amplitude, including drive (distortion). A delay section is provided (at the bottom) with feedback, rate and level. The envelope parameters (classic ADSR) can control both amplitude and wave shape amount. -Envelope: sets the envelope sensitivity for the shaper. The more it is applied, the more the envelope section will influence the overall output. -Total: sets the total amount of shaping. -Split: sets the relative shaping amount for the two waveshapes. -Shift: sets the shift of the waveshaping function (0: sine, 1: cosine). -Frequency: sets the shaper LFO frequency. -Depth: sets the shaper LFO depth. Patches can be named and saved. Remember to save any work before closing, as it won't prompt you to save. Presets (Updated Nov. 23, 2017) To use these presets, copy the presets in the download file and paste them within your ~/.sineshaperpresets file. You may need to number them accordingly (the number preceeding the preset name). -nb: If some presets produce little or no sound, adjust the Shaper Frequency or Depth knob slightly.